Phillips Farms is one of the few producers of this rare, truly one of a kind fruit. 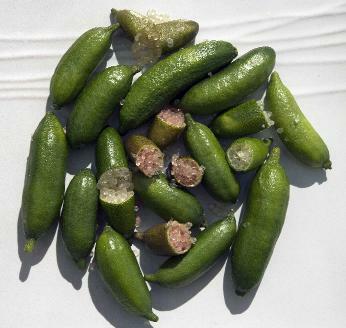 Finger Limes were found growing wild in Australia and we have been able to successfully grow them right here in California. When you cut into this finger shaped relative to the citrus family, you are met with hundreds of tiny little juice vesicles. They only break when you bite into them and release a burst of tangy flavor. The little beads have led some to call these "citrus caviar" and we feel this not only describes their look, but also their rarity and uniqueness. They are a great way to add some color and flavor to recipes, as well as a fun way to make an interesting cocktail. We pack them all by hand and clean each individual piece of fruit. 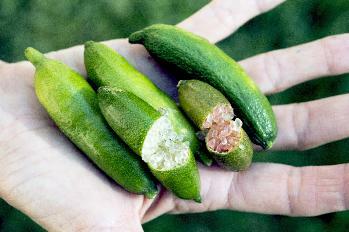 Phillips Farms is proud to offer you the ability to order our Finger Limes directly from our website. We will hand select each piece of fruit that goes into a 1/2 dry pint clamshell (approximately 25-30 pieces of fruit) and are packaged and shipped the same day. Please note: After clicking the Buy Now button you will be taken to our secure PayPal site where you may enter your quantity, payment information and review your order before submitting.